Daily deal industry is the one most talked about ever since it took the world by storm, starting with Woot, reinvented by Groupon, LivingSocial and the likes (we built a couple of solutions on Magento ourselves). There are hundreds of daily deal sites popping up out of nowhere each day, and many are shutting down. With a recent study on the industry conducted by Rice University some of the typical questions get answered. Before we delve into some of the findings of the study, let’s make sure we’re on the same page with some of the terminology as more often than not people get confused with these. Daily deal or group buying – get your deal together! So, which is which, is there any difference? Of course there is! At times these two can refer to pretty much the same thing, but you have daily deals that don’t require a group buying feature (pretty much like Woot has it covered) and group buying deals that last much longer than a single day (which is true for many similar sites) – so, we just need to have our semantics right. What should these terms actually mean? Needless to say, group buying is a more complex methodology to implement as it requires, among others, a “tipping” option (how many customers should buy the deal before it’s actually activated) while simplest form of daily deal discounts can be done fairly easily with many standard ecommerce platforms. So, for the sake of this post, let’s only use “daily deal” and assume group buying is also a part of the big picture. A multi-time period study of daily deal performance conducted by Rice University seems to be the one that really goes in deep with some of the questions they’re looking to answer – and most of them are from the merchant perspective – not your daily deal site customer or the daily deal site itself. This allows us to gain really good insights into not only how daily deal sites value proposition is perceived by the merchants, but also how these promotions have performed over time and how sustainable the whole industry can be. The paper itself is 31 pages long, so not something huge – make some time to go through it as there are some really interesting takeaways (download link below). 1. How profitable are daily deals for the merchants themselves? The most recent results (May 2012) show 61.5% of merchants made profit from the deals they ran, while the percentage of those that broke even or lost money on the deals is pretty much the same (at around 19.3% each) – important to note is that profitable deals percentage has risen since the last year’s study while there are fewer of businesses that reportedly lost money on the deals. 2. What types of businesses profit the most? 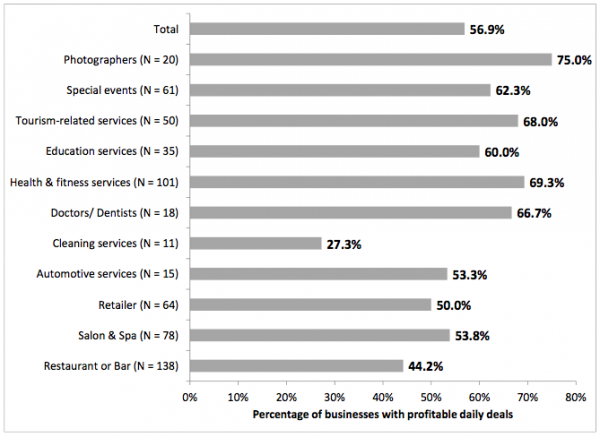 The study shows photographers (75%), health & fitness services (69.3%), tourism-related services (68%) and doctors and dentists (66.7%) have much higher success rates than the average while cleaning services (27.3%) and restaurants&bars (44.2%) more often than not actually end up losing money on these deals. 3. What are new customer acquisition and retention rates for daily deals? Businesses were able to get app. 80% of new customers with each deal, no matter if they ran deals before, while around a third of these customers actually convert into repeat customers. Now, ask yourselves a question – how often have you purchased a deal off of a daily deal site to try out a new service/product and were so happy that you actually decided to come back and pay the full price after the deal? Now you see how difficult it can be for these businesses to turn a profit on these deals. Even so, the latest study results show a number of positive signs for the daily deal industry – it appears as if it’s here to stay for at least a while. You can download the entire study here – check it out! So, with that in mind – are you working on some daily deal sites yourselves? We developed a handful of those that you can see showcased in our portfolio, so if you have some nicely done daily deal sites you’d like to share – do so in the comments below. Sheeel.com wins best e-commerce website in Kuwait award!